A view from the cycle path: How many Dutch children still go to school by bike ? The rise of driving. How many Dutch children still go to school by bike ? The rise of driving. One of the odd things about the Dutch relative to other countries is a habit of washing all their dirty linen in public. Bad news stories have remarkable prominence here and that includes making sure that bad news is heard around the world. In the last few days, headlines have started to appear in Dutch and in English about how children in the Netherlands are being driven to school by car far more than they used to be. According to the headlines, "one third" of children now go to school by car. This sounds alarming, and may seem to fly in the face of what cycling blogs, including this one, have written about cycling to school. Most of the press stories neglected to give a source for their figures and many of them seemed to be based on nothing more than other news websites' stories. This is not great journalism. Yesterday I found what seemed to be a reasonably likely original source for this story and wrote about the figures on the Campaign for Childhood Freedom forum. This blog post expands on that forum discussion. How steep is the rise in driving to school? The figures for cycling and walking to school in the Netherlands remain such that most other countries would be proud to boast about them. However, we have to look at this complaint in the same way as the Dutch are looking at it. For the Netherlands, these figures are not good news. It is true that the rate of driving has increased relative to what it was 18 years ago and even though walking and cycling together are still twice as significant as is driving, they have both decreased. In 1994, 26% of primary school aged (5-12) children went to school by car. In 2012, 30% did so. Cycling (blue) and walking (red) have dropped. It's a decline in cycling and walking, the issue needs addressing, but it's not catastrophic. So exactly how do Dutch children get to school? One of the headline concerns of the Dutch is that only 17% of primary ages children (5-12) now travel to school by bike completely independently of adults. By picking on this figure alone, it can be made to look like a very small proportion of children are now independent. However, as you can see from the above graphic, if you add together independent walking (9%) and independent cycling (17%) then 26% of primary school children actually still travel independently to school. It has been known for some time that the average age for independence is 8.6 years and as it happens, 8.6 years works out as approximately 2/3rds of the way through the primary school age group so this is not so far off the proportion of primary school age children who we already knew were travelling independently in 2006. The share for cars varies from 6 - 48 % for town schools and 34 - 52 % for country schools. The share for bikes varies from 16 - 65 % for town schools and 20 - 44 % for country schools. The share for walking varies from 18- 63 % for town schools and 17 - 37 % for country schools. ask me not to report her to the police (never my intention). These variations are actually nothing new. For instance, it's five years since I wrote about how Amsterdam had the lowest first year secondary school cycling rate in the country. This is perhaps what should be expected for the largest and busiest city in the country, and we shouldn't be surprised that other busier or less well planned Dutch cities have lower rates of child cycling than the better planned cities. But problems like this in some of the areas with a larger population skew the average figures for the entire nation downwards and make the picture look worse than it is in the better organised areas. On the other hand, in some places the frequency of driving to school is very much lower and the frequency of cycling is much higher. It's been illegal to use a car to take a child to primary school in Groningen for several years. Here in Assen a new housing development was planned to enable 2/3rds of primary school trips to be by bike. Neither of these ideas are unique to single places and in much of the country there really are an overwhelming majority of trips to school made by bike and walking. Planning so that journeys are safe and convenient by bike is what makes this possible. It should also be noted that there are also special types of school to which more children will also be driven. In the area where we live there are absolutely no school buses at all except for those which pick up children who have special needs and take them to schools to which they may not be able to travel unaccompanied, perhaps located further from their home than another school which is less suitable for their needs. At special needs schools you also find far more private cars than at average schools. I don't know if schools like this were included in the KPVV figures but if they were they will have made the numbers look worse. There are also other schools which have unusually large catchment areas such as English language "international" schools for families of temporary workers. I don't know if these are included in the KPVV figures either, but they would also push the average upwards if they are. Note that all the figures above are for primary schools. i.e. children up to the age of 11 or 12. There is a much higher rate of cycling to secondary schools than to primary schools. Almost all secondary school aged children travel independently and almost all of them travel by bicycle. Some primary schools in the Netherlands, particularly older schools which have not been improved, don't actually have sufficient cycle-parking for the number of children who want to cycle. At some of these, children are not allowed to cycle if they live within a specified radius, perhaps 1 to 1.5 km, of the school. They are supposed to walk instead, but of course this is not always what happens. The best solution to overflowing bicycle-parking at school is to build more bicycle-parking. Keeping up with the demand is difficult but cycle-parking is expanding all across the Netherlands. I think the KPVV and others in the Netherlands are absolutely right to raise this issue and I hope that the decline in cycling and walking can be stopped. It is the job of campaigners everywhere to be critical and to show figures in a negative light. This is the only way to make progress. Perhaps the alarmist headlines are required within this country in order to wake people up and stop this decline. It worked before. Nowhere can afford to be complacent and to sit on its laurels, and that applies even to places which see themselves or are seen by others to be leaders. However the exposure of this story in English could be misleading and that's the reason why I have written about this story. 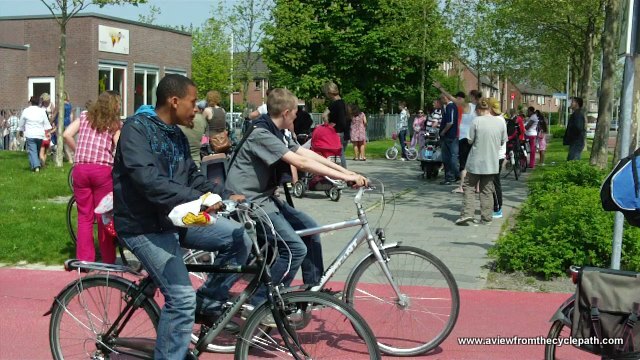 For other countries, the Netherlands is still the best place to look towards in order to see how to cater for mass cycling to school. However, even here you need to find the best examples to copy. I'm very happy to see that the Fietsersbond is using this publicity to call for better conditions for cycling near schools. Amongst other things they are calling for a 100 m car free zone around all schools and woonerven (15 km/h speed limit and child priority) and kiss&ride places at the edge of the 100 m car free zone. The Netherlands is still a long way away from being the sort of place where an "eco" school would ban cycling. It would be interesting to see this figures split by distance to school. Since the minimum number of children at a school is raised by the government in the last decades, a lot of smaller schools had to close down, which would lead to longer distances which might be less desirable to cycle.